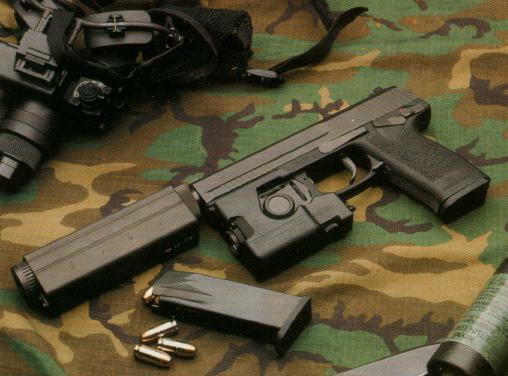 In August, 1991 a request was made for the U.S. Special Operations Command (USSOCOM) for an "offensive" handgun. 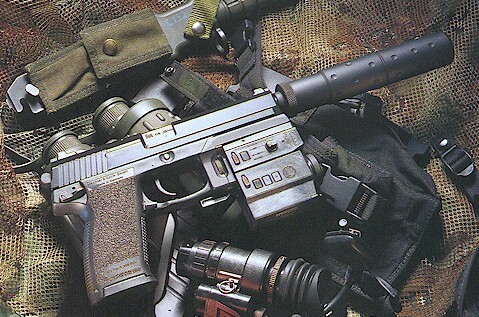 Dianne Feinstein, Charles Schumer and President Clinton would probably tell you that all handguns are offensive, but SOCOM had something different in mind. Termed the OHWS, for Offensive Handgun Weapon System, it was a pistol designed within certain specified parameters that would be sufficient for conducting "offensive" operations, as opposed to the more tradtional role for the handgun, for "defensive" operations. HK and Colt were chosen to compete against each other for the new pistol. HK eventually won out, and the contract was awarded to them. It has undergone many changes from its birth in 1991. Some are obvious, some are not. 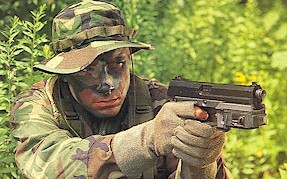 The official name for the pistol is Mark 23, Mod 0. Not very catchy. That is why it is more popularly known as the SOCOM. 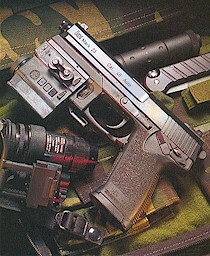 The SOCOM was designed by the great HK engineer, Helmut Weldle. 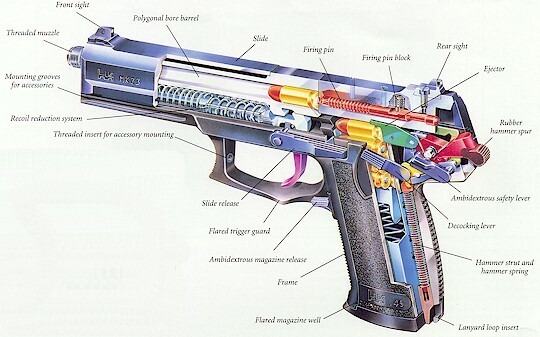 The gun holds 12 cartridges of .45 ACP ammunition. 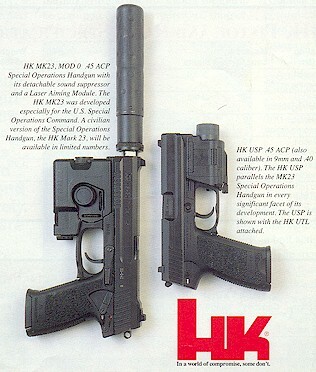 In a move that the above folks would surely find offensive, HK offered a limited number of SOCOM pistols to the citizenry of the United States, and left the threaded barrel intact. The suppressor sold by HK with the gun is made by Knight's Armament Company of Vero Beach, FL. It is usable wet or dry, with wet knocking even more dB from the already quiet can. 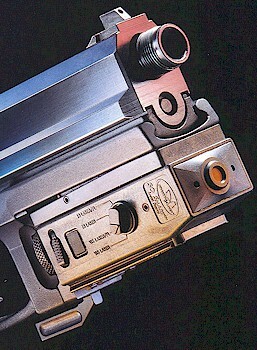 Insight Technology Inc., the maker of the UTL series for the USP pistols, was chosen to provide the Laser Aiming Module. It had a dual laser, one visible light, and one infrared, visible only with night vision. Wilcox Industries Corp. has the LAM featured in the Ichiro Nagata photos that start this page. I have not heard that this is the new unit that SOCOM adopted over the one made by Insight, but it appears to be the case. The SOCOM pistol has reportedly met with tepid enthusiasm on the part of the operators it was ultimately issued to, due to its huge size. It feels like a Desert Eagle, and rivals it in size. The introduction of the USP Tactical seems to have answered the size questions, and may prove to be more popular in the long run. One of the uncompromising attributes of the SOCOM pistol, however, is the extreme accuracy. It is an absolute tack driver, with groups possible under two inches at 50 yards. No matter what you think about a handgun replacing a shoulder fired weapon as an offensive arm, the staff at HK produce what they are asked to produce. This was a request from the U.S. government. They were provided with a list of what they wanted, and as usual, HK delivered. No one takes firearm photos better than the great Ichiro Nagata of Guns and American Handgunner magazines. These first images represent some of his work. He is an accomplished competitive shooter in his own right. 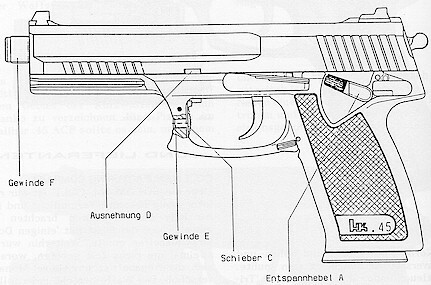 Early production diagram of the SOCOM pistol. Incorporated into this early prototype is the "Schieber," defined literally from the German as a "sliding safety." This is in actuality the slide lock that was dropped from the latest production models. The slide lock functioned to keep the slide from opening upon firing, which allowed the firer to retrieve the spent casing for added stealth, and added to the quietness of the fired shot by eliminating slide movement. 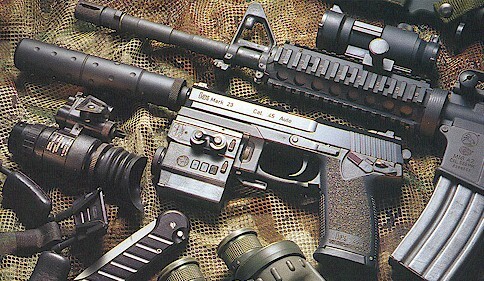 Early prototype with early rectangular suppressor and LAM unit. (LASER Aiming Module). This suppressor and LAM were dropped for the current units as described above. 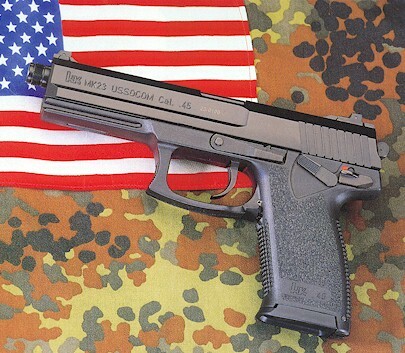 Ad bragging on the SOCOM for civilian USP sales that clearly shows the common lineage of the two handguns. This ad, though not clearly readable, announces that limited numbers of a civilian version of the SOCOM will be available. 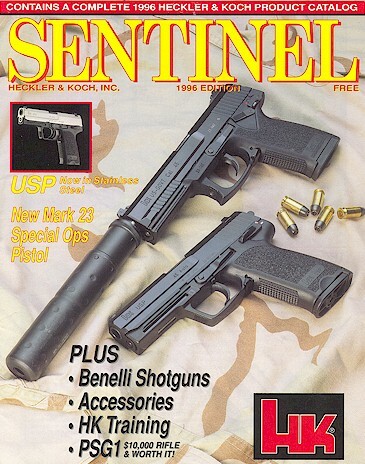 Cover of now defunct HK Sentinel magazine/catalog from 1996 with catchy photo of the SOCOM pistol with the USP45, its little brother. Photo also shows some of the +P Black Talon rounds from Olin/Winchester made for use with the SOCOM.